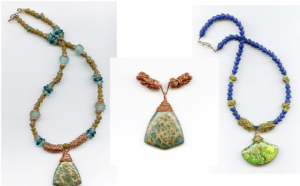 If you love working with wire, don’t miss out on your chance to take one – or both – of these classes with artist, author & amazingly inspiring Melody MacDuffee. She’s here for just a few days…. teaching & trunk show on Saturday April 19th & Monday April 21st. Saturday, April 19th, 10 a.m. – 1 p.m., $25 class, supplies not included, intermediate level wireworking. 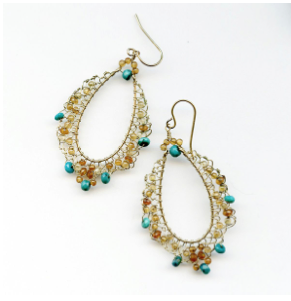 Combine wire and beads and learn how to make these gorgeous beaded filigree earrings. We bet you won’t make just one pair! A curlicue lace bail! We’re excited to host Melody MacDuffee as she shows us how to make a bail and pendant wrap out of wire. Come try out this fun technique! (class is for bail and pendant wrap only, not whole necklace). Saturday, April 19th, 2-5 p.m., $25 class, supplies not included, intermediate level wireworking.